The Moogle Shop is a place that you synthesize items to make new weapons and armor, as well as a place where items and cards can be bought. According to Jiminy, Moogles usually operate their shops using holograms because they hate getting their pom-poms ruffled. The Moogle Synthesis Shop in Kingdom Hearts. Moogles appear only in Traverse Town, after the destruction of their respective home worlds. After Sora uses the green Trinity Mark in the Accessory Shop in the First District, the Synthesis Workshop, run by several moogles, is opened. Sora can then go there to allow the moogles to use some of his items to make new ones. In order to synthesize certain items, certain synthesis sets must be completed first. In order to unlock the following set, the previous set must have all materials created. The first set is available upon the shop opening. Once this list is completed, synthesis set two becomes available, and so on. Every synthesis set consists of two items and four accessories. Completing the four sets unlocks the fifth and final set, which is composed of only one option: Sora's Ultima Weapon Keyblade. In Kingdom Hearts Final Mix, the number of items that can be synthesized have been increased to 33 items, to which they are now available in six different sets. The second set is unlocked after synthesizing 3 items, the third set is unlocked after synthesizing 9 items, the fourth set is unlocked after synthesizing 15 items, the fifth set is unlocked after synthesizing 21 items, and the sixth and final set is unlocked after synthesizing all 30 items from the previous five sets. In addition, the recipes for the items from the original game have also been changed, to which some of them even require synthesis materials that are exclusive to Final Mix. The moogles also award Sora the ability Encounter Plus after synthesizing 15 items which can help with encountering Heartless to collect synthesis materials. 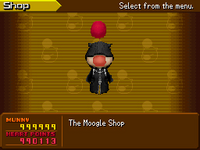 The Moogle Shop as seen in Kingdom Hearts Chain of Memories. The Moogle Shop as seen in Kingdom Hearts Re:Chain of Memories. 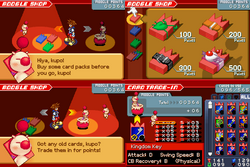 The Moogle Shop can appear in any world in "Sora's story", excluding 100 Acre Wood, but must be summoned by creating a Moogle Room with their eponymous map card. 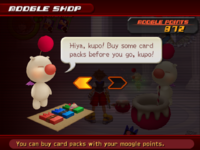 Moogle Shops sell a limited stock of packs of five random cards for Moogle Points; the packs are organized by card type (Attack, Magic, Item, and Assorted) and rarity (Leaf, Brown, Black, and Moogle). However, the higher rarity packs are only stocked in Moogle Shops generated after Sora reaches certain floors of Castle Oblivion, and once a shop's stock is exhausted, Sora may no longer buy packs at that specific shop, and must summon a new one to continue. Sora may also sell individual battle cards, excluding boss enemy cards, at set prices, and is given a free Leaf Attack Pack the first time he talks to the Moogle in a new Moogle Room. The Moogle Shop in Kingdom Hearts II. The Moogle Shop is present on all playable worlds, and Moogle Shops sell Items and Equipment. Mog's Workshop in Radiant Garden and Elmina's Moogle Shop in Twilight Town are run in-person, while all other shops are run by hologram. Each Moogle Shop also runs a synthesis Workship, allowing Sora to deposit synthesis materials and craft new items. Each Moogle Shop will add Ingredient-class synthesis materials of the Shard, Stone, and Gem ranks to its stock, once Sora deposits 30, 25, or 20 of specific type of material, respectively, at any of them. Each shop also sells unique weapons or items, but once Sora visits a new shop its unique stock is added to those carried by the various item and equipment shops at Radiant Garden and Twilight Town. Items can also be sold back to the various shops at 25% of their list price, while Equipment can be sold at 50% of its list price; all equipment obtained from synthesis or enemy drops has a list price of 20 munny. Blazing Shard 100 Once 30 have been deposited. Blazing Stone 200 Once 25 have been deposited. Blazing Gem 400 Once 20 have been deposited. Frost Shard 100 Once 30 have been deposited. Frost Stone 200 Once 25 have been deposited. Frost Gem 400 Once 20 have been deposited. Lightning Shard 100 Once 30 have been deposited. Lightning Stone 200 Once 25 have been deposited. Lightning Gem 400 Once 20 have been deposited. Lucid Shard 100 Once 30 have been deposited. Lucid Stone 200 Once 25 have been deposited. Lucid Gem 400 Once 20 have been deposited. Power Shard 100 Once 30 have been deposited. Power Stone 200 Once 25 have been deposited. Power Gem 400 Once 20 have been deposited. Dark Shard 100 Once 30 have been deposited. Dark Stone 200 Once 25 have been deposited. Dark Gem 400 Once 20 have been deposited. Dense Shard 200 Once 30 have been deposited. Dense Stone 400 Once 25 have been deposited. Dense Gem 800 Once 20 have been deposited. Twilight Shard 200 Once 30 have been deposited. Twilight Stone 400 Once 25 have been deposited. Twilight Gem 800 Once 20 have been deposited. The Moogle Shop in Kingdom Hearts 358/2 Days. A Moogle appears in the Grey Area in The World That Never Was and the Station Plaza in Twilight Town, wearing a Black Coat. The Moogle sells various Panels and items for Heart Points, but also assists Roxas with item synthesis, and redeems his Challenge Sigils and Mission Crowns for various prizes. While the Moogle has a business relationship with Organization XIII, he holds no loyalty to them, and ends up following his best customer, Roxas, when the latter flees The World That Never Was. The Moogle Shop is also available on the main menu during Mission Mode. ↑ In the Japanese version of the game, this is the Pandora's Gear ⑤ instead. The Command Shop in Kingdom Hearts Birth by Sleep. The Medal Shop in the Mirage Arena. The Command Shop is present on all playable worlds except for the Mysterious Tower, the Realm of Darkness, and the Mirage Arena, which has a Medal Shop instead. Command Shops only sell Commands, while the Medal Shop also sells Key Items and Synthesis Materials. The Medal Shop and Radiant Garden Command Shop are run in-person, while all other shops are run by hologram. The Shop will add new Commands to its stock each time the protagonist completes a world's episode, and will also add copies of most Commands once the protagonist acquires it for the first time. Meanwhile, the Medal Shop will add new goods once the protagonist reaches specific Arena Levels. Goods can also be sold back to the Command Shop for 50% of their list price, with each gained level increasing its value by 25% of that price, and an attached ability increasing it by an additional 50%. The Moogle Shop in Kingdom Hearts Re:coded. Moogles appear as data to help Data-Sora with Item Synthesis. 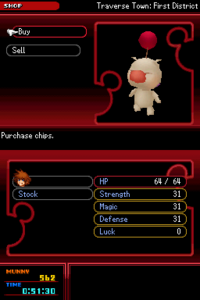 Moogles appear as data and sell command chips, accessory chips, and finisher chips to Data-Sora. More items are added according to the Data-Sora's progress. Goods can also be sold back to the Shop at varying prices depending on their type and level. The sell price of a good is , where is the base price of the command at level 0, which ranges from 100 to 800 depending on the type of the command, and is the current level of the command. The Peddler in Data-Agrabah sells the same inventory with the same prices as the moogles. The Moogle Shop is present on all playable worlds except for Destiny Islands, and sells Commands, Spirit Items, and Training Toys. Traverse Town also contains a Medal Shop which sells rarer items in exchange for the medals awarded in Flick Rush. The Medal Shop and Traverse Town Moogle Shops are run in-person, while all other shops are run by hologram. The Shop will add new Commands to its stock each time the protagonist completes a world's episode, and will stock exclusive goods during a Bargain Flurry. Goods can also be sold back to the Moogle Shop for 50% of their list price, and during a Bargain Flurry, they can be bought for only 80% of their normal price. Blazing Shard 100 Obtain at least 30 Blazing Shards. Blazing Stone 200 Obtain at least 25 Blazing Stones. Blazing Gem 300 Obtain at least 20 Blazing Gems. Frost Shard 100 Obtain at least 30 Frost Shards. Frost Stone 200 Obtain at least 25 Frost Stones. Frost Gem 300 Obtain at least 20 Frost Gems. Lightning Shard 100 Obtain at least 30 Lightning Shards. Lightning Stone 200 Obtain at least 25 Lightning Stones. Lightning Gem 300 Obtain at least 20 Lightning Gems. Lucid Shard 100 Obtain at least 30 Lucid Shards. Lucid Stone 200 Obtain at least 25 Lucid Stones. Lucid Gem 300 Obtain at least 20 Lucid Gems. Pulsing Shard 100 Obtain at least 30 Pulsing Shards. Pulsing Stone 200 Obtain at least 25 Pulsing Stones. Pulsing Gem 300 Obtain at least 20 Pulsing Gems. Writhing Shard 100 Obtain at least 30 Writhing Shards. Writhing Stone 200 Obtain at least 25 Writhing Stones. Writhing Gem 300 Obtain at least 20 Writhing Gems. Betwixt Shard 100 Obtain at least 30 Betwixt Shards. Betwixt Stone 200 Obtain at least 25 Betwixt Stones. Betwixt Gem 300 Obtain at least 20 Betwixt Gems. Twilight Shard 100 Obtain at least 30 Twilight Shards. Twilight Stone 200 Obtain at least 25 Twilight Stones. Twilight Gem 300 Obtain at least 20 Twilight Gems. Sinister Shard 100 Obtain at least 30 Sinister Shards. Sinister Stone 200 Obtain at least 25 Sinister Stones. Sinister Gem 300 Obtain at least 20 Sinister Gems. Soothing Shard 100 Obtain at least 30 Soothing Shards. Soothing Stone 200 Obtain at least 25 Soothing Stones. Soothing Gem 300 Obtain at least 20 Soothing Gems. Hungry Stone x 1 Obtain 12 different synthesis materials. Writhing Shard x 2 Obtain a synthesis material. Hungry Shard x 1 Obtain 12 different synthesis materials. Hungry Gem x 1 Obtain 20 different synthesis materials. Hungry Shard x 1 Obtain 20 different synthesis materials. Hungry Stone x 1 Obtain 32 different synthesis materials. Hungry Gem x 2 Obtain 42 different synthesis materials. Hungry Crystal x 2 Obtain 50 different synthesis materials. Hungry Crystal x 1 Obtain 22 different synthesis materials. Hungry Shard x 2 Obtain 8 different synthesis materials. Lucid Crystal x 2 Obtain 58 different synthesis materials. Hungry Shard x 1 Obtain 18 different synthesis materials. Hungry Stone x 1 Obtain 42 different synthesis materials. Writhing Gem x 2 Obtain 48 different synthesis materials. Hungry Gem x 2 Obtain 52 different synthesis materials. Soothing Crystal x 1 Obtain 55 different synthesis materials. Hungry Crystal x 1 Obtain 58 different synthesis materials. Twilight Gem x 2 Obtain 48 different synthesis materials. Pulsing Crystal x 1 Obtain 55 different synthesis materials. Twilight Gem x 2 Obtain 45 different synthesis materials. Hungry Gem x 1 Obtain 50 different synthesis materials. Blazing Shard x 5 Obtain 2 different synthesis materials. Hungry Shard x 1 Obtain 10 different synthesis materials. Blazing Stone x 5 Obtain 25 different synthesis materials. Hungry Stone x 1 Obtain 38 different synthesis materials. Frost Shard x 5 Obtain 4 different synthesis materials. Frost Stone x 5 Obtain 25 different synthesis materials. Lightning Shard x 5 Obtain 4 different synthesis materials. Lightning Stone x 5 Obtain 25 different synthesis materials. Writhing Shard x 5 Obtain 2 different synthesis materials. Hungry Shard x 1 Obtain 15 different synthesis materials. Writhing Stone x 5 Obtain 28 different synthesis materials. Hungry Shard x 1 Obtain 40 different synthesis materials. Soothing Shard x 5 Obtain 4 different synthesis materials. Soothing Stone x 5 Obtain 28 different synthesis materials. Lucid Shard x 5 Obtain 8 different synthesis materials. Lucid Stone x 5 Obtain 28 different synthesis materials. Lightning Crystal x 1 Obtain 40 different synthesis materials. Hungry Crystal x 1 Obtain 55 different synthesis materials. Lucid Shard x 6 Obtain 2 different synthesis materials. Lucid Stone x 6 Obtain 12 different synthesis materials. Lucid Gem x 6 Obtain 18 different synthesis materials. Pulsing Stone x 3 Obtain 35 different synthesis materials. Pulsing Gem x 3 Obtain 45 different synthesis materials. Sinister Stone x 3 Obtain 35 different synthesis materials. Sinister Gem x 3 Obtain 45 different synthesis materials. Blazing Shard x 5 Obtain 30 different synthesis materials. Frost Shard x 5 Obtain 30 different synthesis materials. Lightning Shard x 5 Obtain 30 different synthesis materials. Lucid Shard x 5 Obtain 32 different synthesis materials. Pulsing Shard x 5 Obtain 30 different synthesis materials. Writhing Shard x 5 Obtain 35 different synthesis materials. Twilight Shard x 1 Obtain 6 different synthesis materials. Twilight Stone x 1 Obtain 15 different synthesis materials. Twilight Gem x 1 Obtain 32 different synthesis materials. Twilight Crystal x 1 Obtain 42 different synthesis materials. Soothing Shard x 5 Obtain 32 different synthesis materials. ↑ 1.0 1.1 1.2 Available with a Rush Level of 20. This page was last edited on 22 April 2019, at 14:50.